Who What Wear's latest "Ask a Stylist" column with the designers from Current/Elliot has a lot of great tips, but I couldn't get over the A.P.C. heart-print cotton tee they recommended. It's the sophisticated version of the heart prints we wore growing up, don't you think? I would wear the A.P.C shirt on days I'm feeling ladylike, and this awesome Laugh Cry Repeat tee in white if I wanted a girly shirt with a downtown vibe, maybe with black jeans and moto boots. 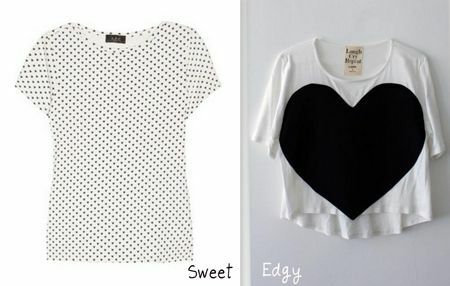 Edgy heart print - it can happen. Here's some more options I heart (haha): the Laugh Cry Repeat tee in tote bag form, a cute ASOS cardigan with heart elbow patches, what may be the most adorable sweatpants ever, and of course, Comme des Garcons canvas heart high-tops. August 9, 2012 by Adele Chapin.